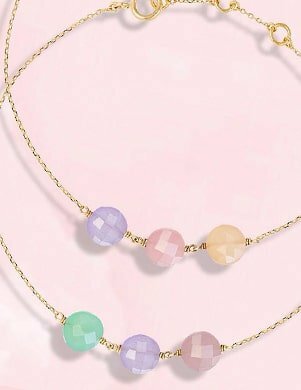 Pastel jewellery is fun, vibrant and a great year-round accessory. 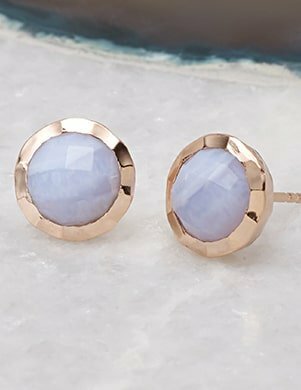 These soft ice-cream shades are the best way to add a touch of femininity to any outfit, and lucky for us there are so many gorgeous gemstones that come in pretty pastel tones. Create a fresh look with some pink Rose Quartzes, baby blue Topazes or light violet amethysts. They are perfect for adding a pop of colour to your look in a soft and subtle way. From cotton candy hair, pastel clothes to all the soft marshmallow shades jewellery, we all scream for these sweet pastel tones. Luckily for us, these delicious shades have no intention of leaving the fashion stage. Let's join the pastel party this season with our designer jewellery. Rose Quartz and peachy Tourmaline stones are the ultimate “Pretty in Pink” gemstones. 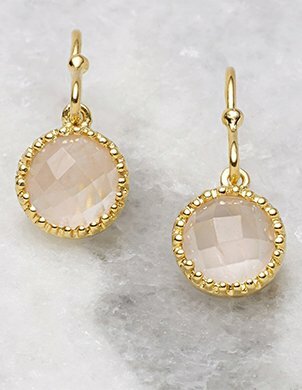 The baby pink tones combined with silvers and golds create subtle, light, bright pieces that are effortlessly timeless. 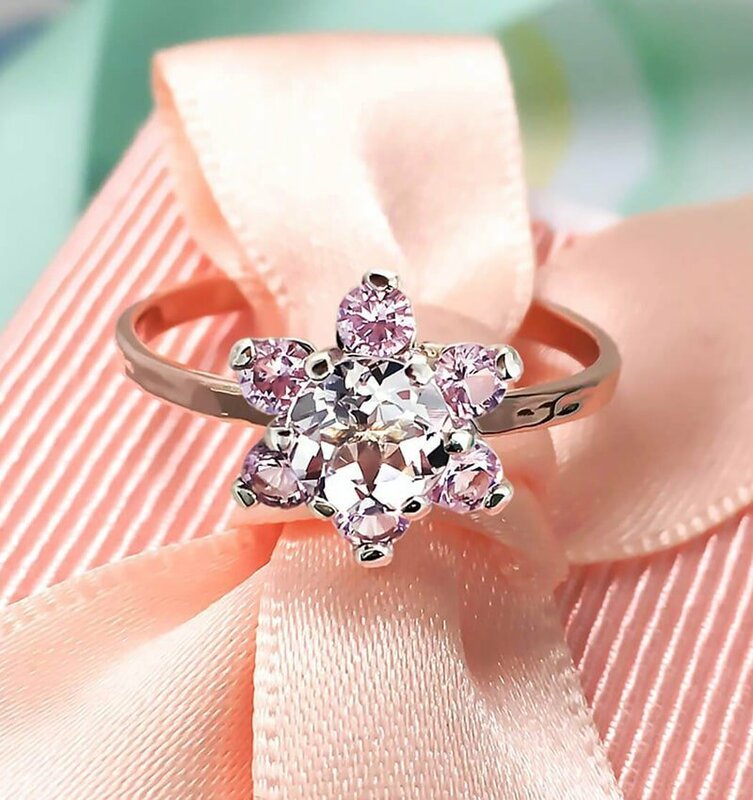 The colour of love, friendship and harmony, pink is the perfect colour to show how much you adore someone. Gemstones boasting this colour simply have “heartfelt gift” written all over them. 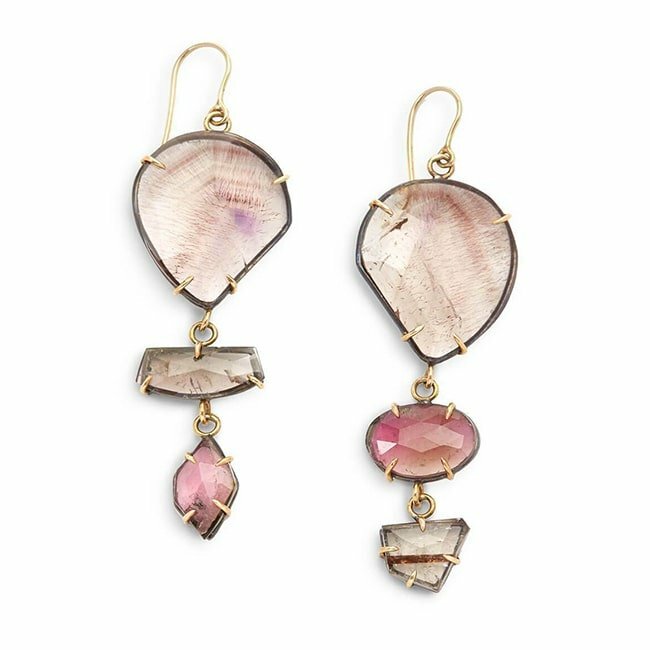 These magnificent tourmaline earrings in various hues of pink are from Gabrielle Friedman Designs. The artist Gabrielle Friedman is based in Nashville. She draws inspiration from nature, philosophy, art and her homeland of Cape Town, South Africa. Rose Quartz is a symbol of love, it enhances any outfit and their elegant design. Soft pink is the colour to be seen wearing this year, and these earrings are the perfect gift for a friend or just a treat for yourself. As blue as the sea and as bright as the sky, baby blue hues are tranquil, calming and always fresh. Allow the sea breeze wash over you and fill you with peace every time you gaze at beautiful blue stones. 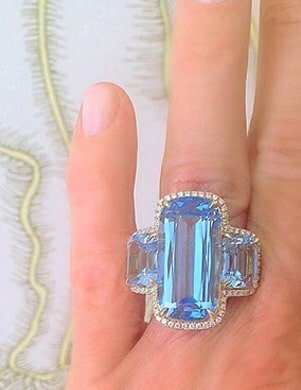 Shimmering baby blue and bright sky blues are perfectly embodied in blue Topaz and Labradorite stones. Blue gemstones are believed to represent calm in crisis and allow the wearer to find the courage to speak from the heart. 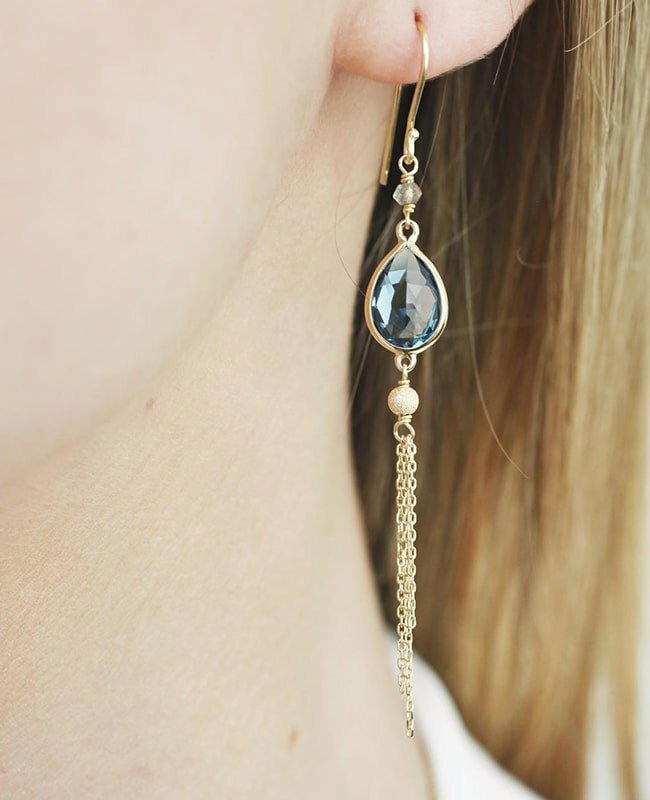 Precious Tassel Drop Earrings in blue Topaz and gold. 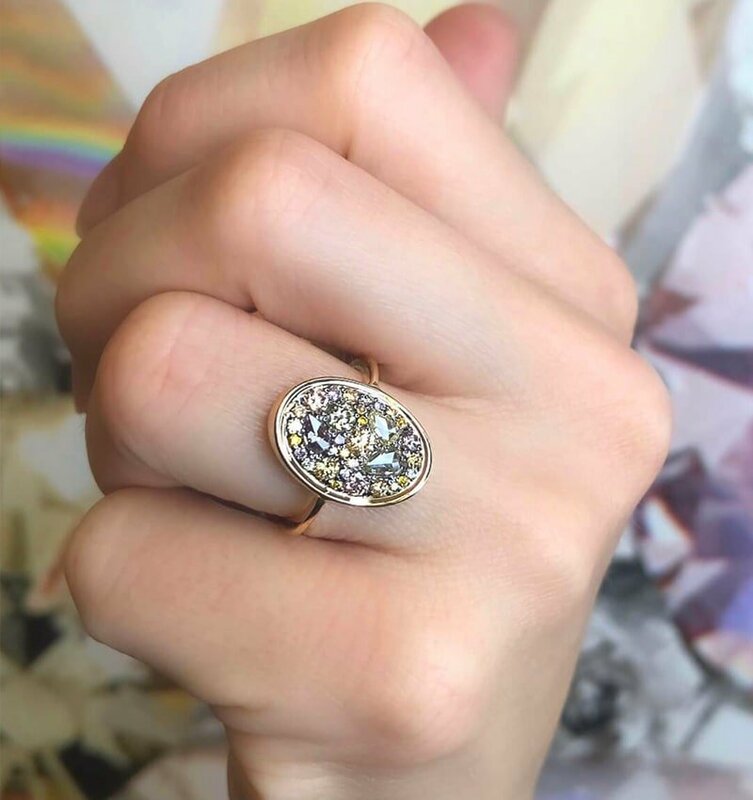 They are the jewellery pieces you need that will work all year round. 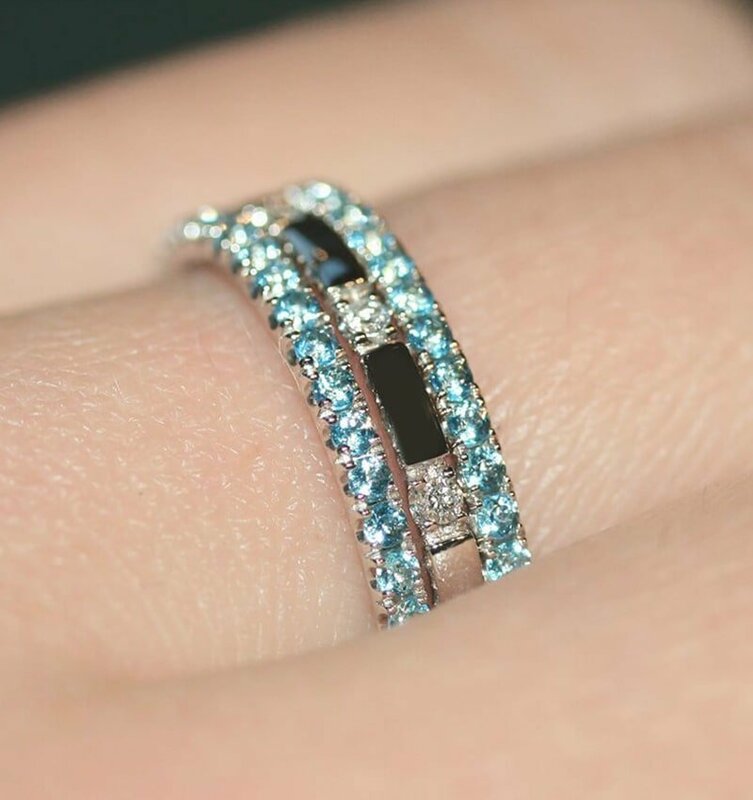 A unique 10 stone diamond ring set in 18kt white gold and surrounded by 2 fully set blue topaz eternity rings also in 18kt white gold. From makeup trends to the latest fashion, we have seen the creamy pastel purple hues everywhere. If you follow fashion blogs like it’s your job, then maybe you have added this lighter sister purple, lavender shade to your jewellery collection already. 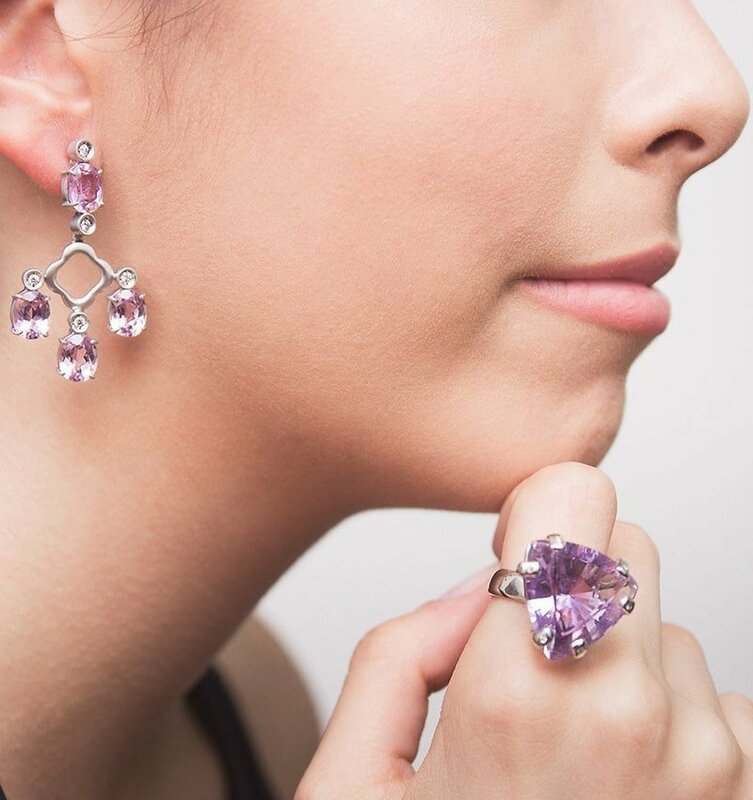 Soft, subtle and ultra-feminine, take your fashion game up with some pinkish purple gemstones such as Kunzites and Amethysts. The cupcake inspired violet colour is for the girls who want to spice up their looks with some sweet and romantic vibe. 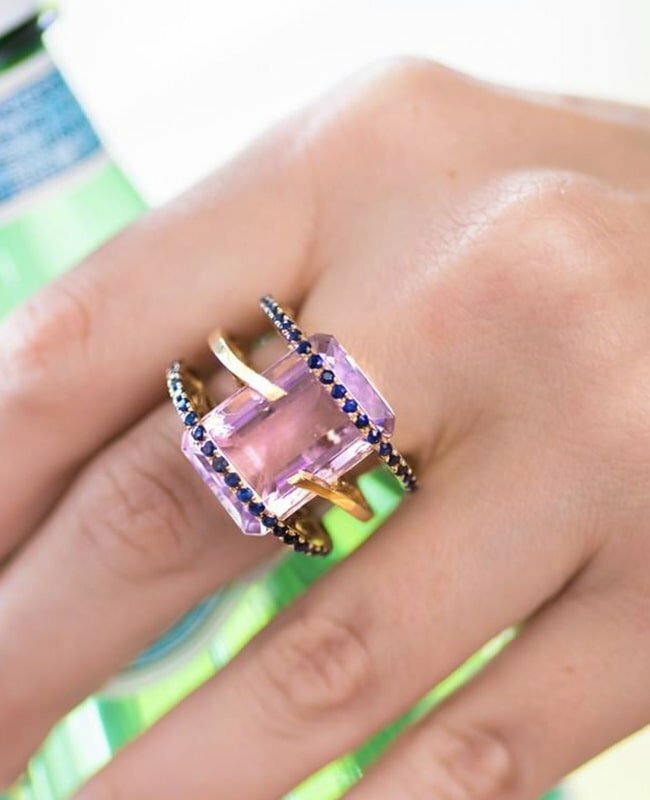 A bright pink amethyst sits on three handcrafted 18kt yellow gold bands to create this quirky, modern ring. 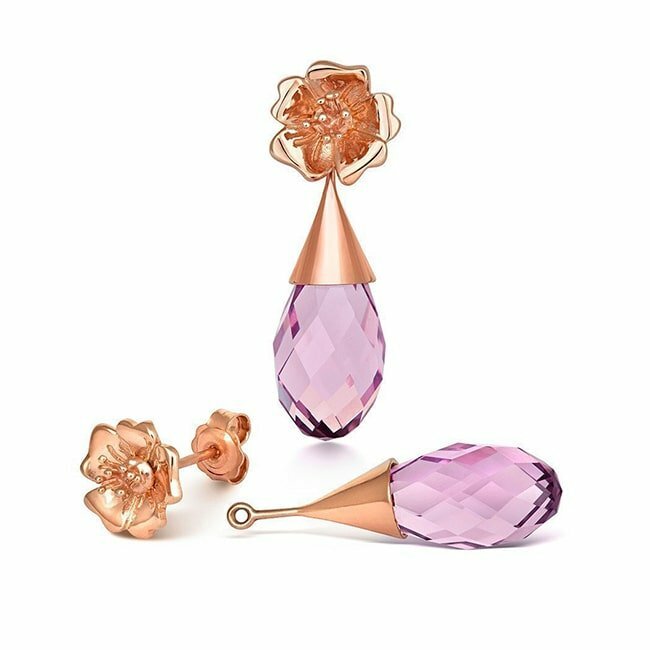 These Wild Rose Stud Earrings can be worn alone or with Adaptagem amethyst crystal drops, available in 24kt rose or yellow gold vermeil and are 100% certified Fairtrade. Who doesn’t love rainbows and unicorns?! Think a rainbow after a storm, unicorn dreams and pink Cotton Candy at the fayre; these jewels represent so many magical things. Simply pair them with your favourite festival outfits, best Friday night dress, casual Sunday afternoon attires and you'll look magi-COOL with all these rainbow shades! 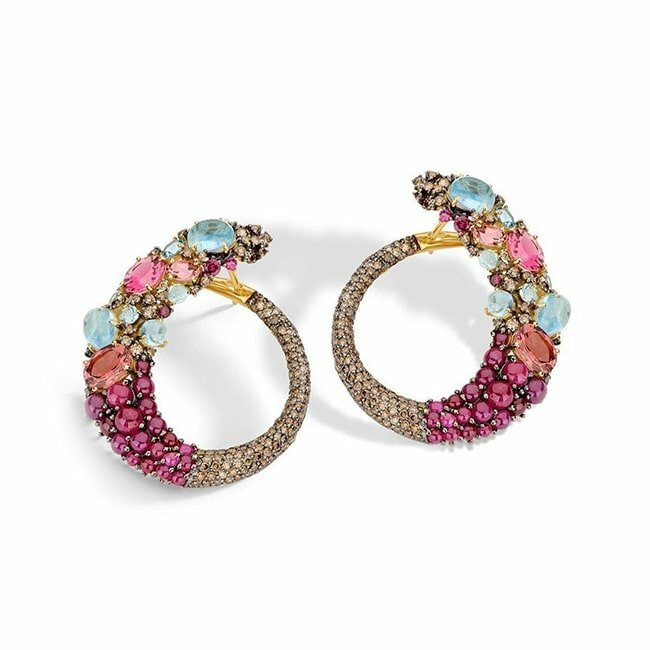 Surrounded with essences of brown diamond, Brazilian pink tourmaline, aquamarine, ruby and smoky quartz, one half of the hoop displays luscious colours whilst the other adds a subtle touch of diamonds. 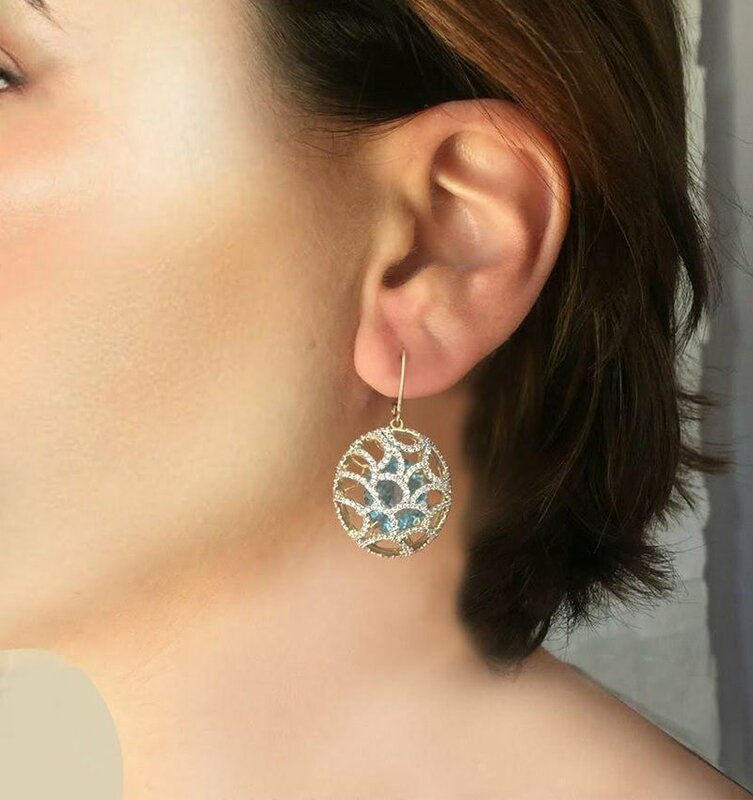 These earrings offer a feminine appeal for a standout look. Designed by Joke Quick - a jewellery designer and master of both colour and contrast. 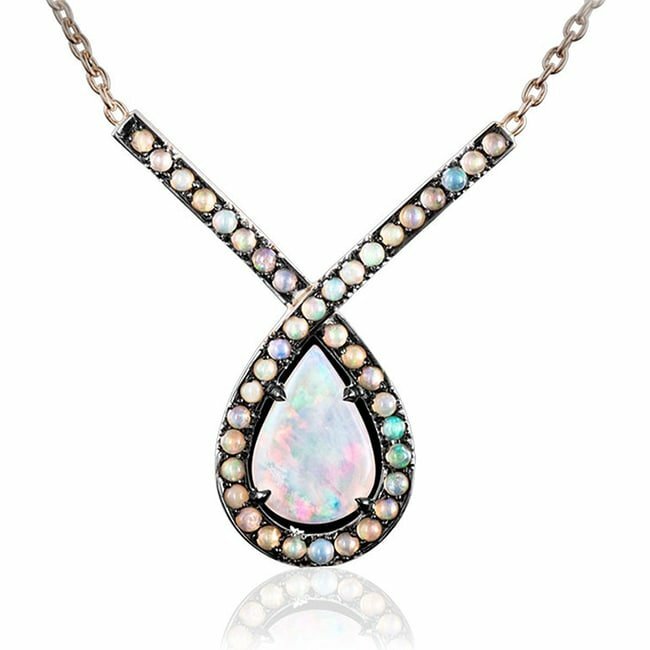 This exquisite piece set with a pear shaped Australian opal and opal cabochons. Autumn may be here but that doesn't mean we have to put away the spring colour palette!